Walking to the baseline of the tennis court, junior Sajin Smith screeches, “Go Perry!” as several students from Perry Meridian watch in anticipation at the events about to unfold at the match against Whiteland Community High School. Smith has played tennis since he was five years old after being nudged from his family to try the sport. 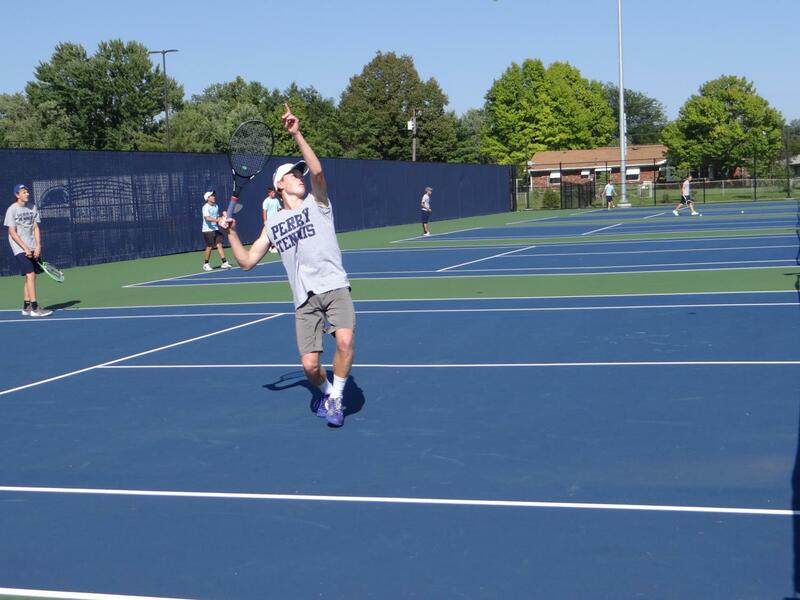 His father, Bryan Smith, previously ran tennis clinics for the Southside at Center Grove High School, but made the switch to Washington Township summer clinics at North Central High School. Fast forward twelve years, and Smith can be seen playing number one singles for the boys tennis team. However, being the number one player in a varsity lineup does not make Smith feel pressured to be the best. Aside from Smith being known as a talented athlete among his fellow teammates, he is known as a leader. “He is always helping the team on the court with technical and tactical tips while also supporting off the court as an enthusiastic teammate,” says his coach, Richard Lord, also the assistant director of the IUPUI Sports Complex. Smith’s progress originates from his constant practice schedule. Either before or after each practice, he practices with teammates or his dad for an hour. During the offseason, Smith does not stray too far from the courts. Smith says he can be seen practicing six days a week on average, two-to-five hours a day, plus an hour of workouts. This consistent practice has paid off: He had an undefeated regular season last year, made it to state, and participated in several tournaments throughout the previous year. While his schedule is rigorous during the school year, Smith accredits his hard work to the progress he makes out on the court. Despite the long hours and exhaustion he faces from his daily practice, Smith still remains positive and appreciative of his time spent on the court. The boys will take on Bloomington North next Tuesday, Sept. 4 at 6 p.m.